Awards can work wonders for exposure. Take Arcade Fire for instance. Back in 2004, the band had put out a critically-adored debut album, but to the mainstream masses, the members were just a bunch of kids from Canada that nobody'd ever heard of – that is, until one fateful night in 2011 when a confused Barbra Streisand announced that Arcade Fire took home the top prize at the 53rd Annual Grammy Awards. Of course, such exposure to the red carpets, big money music executives, and selfie possibilities with Daft Punk could potentially change any critically-beloved band, scaring those that came to love them before The Grammys. Well, it's a good thing that a golden gramophone won't change Michael League and musical collective Snarky Puppy from doing what they do best: making excellent jazz-fusion tunes that deserve your attention. "I'm still wearing a $20 hoodie from H&M right now and an old pair of shoes,"League says over the phone before a Snarky Puppy show in Charlotte, N.C. "Also, the band doesn't play any differently. We're the same band that we were before we won the Grammy. We grow every day and get better every day, but that has nothing to do with the award." No, it probably has more to do with the fact that the members of Snarky Puppy are dedicated to making infectious pieces of ear candy, which helped them win the "Best R&B Performance" Grammy this past February for their take on Brenda Russel's "Something." The band, which consists of a rotating cast of up to 30 different musicians but typically boasts eight or nine members at each gig, will be bringing their award-winning talents to the crooked i Thursday, March 20 for a show presented by the Mercyhurst Institute for Arts & Culture. While the Grammy win won't be affecting the band's play – which is good, because these Puppies can play – it still is great to see a group like Snarky Puppy earning more attention for their jazzy gifts. "For reputation in the music world, it's big, because I think the music industry never really acknowledged our existence," League says. "Not that they ignored us, just that they really never heard of us. Music lovers and musicians have known who we are for a long time, so for them, the Grammy is a celebration point, an example of how a band that plays music that isn't the norm can still win the highest award that you can as a musician." There are plenty of ways to tell a story, but sometimes it takes more than words to get a point across. For Whispers of Light: A Story of Hope, the best way to communicate is through dance. The Highmark Caring Place and Maria Caruso's Bodiography Contemporary Ballet Repertory Company are teaming up to put on an original ballet at the Warner Theatre Saturday, March 29. The performance will help tell the stories of grieving children and the differences that the Caring Place has made in their lives by comforting and supporting them in dark times. In fact, these children not only act as inspiration for Whispers of Light, but will also star in the production, as some of them will be up on stage to tell their tales as the dancers gracefully move along to Nancy Galbraith's original score. Attending a great show can feel like a religious experience, so it makes sense that the crooked i is bringing in The Reverend Peyton's Big Damn Band to put on a musical sermon of sorts Saturday, March 29. 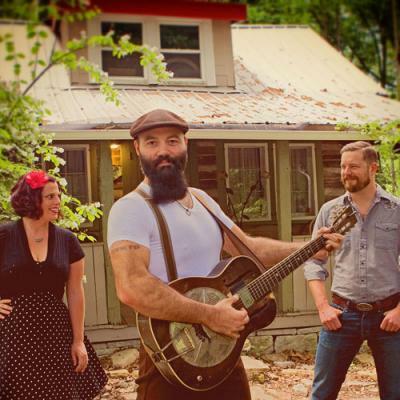 The Indiana trio, made up of guitarist and vocalist The Reverend Josh Peyton, washboard player Breezy Peyton, and drummer Ben Russell, built up a group of faithful followers with their honest, down-to-earth blues tunes featuring plenty of quick pickin' and grit. Locals might remember them brightening up a fairly rainy day at Crawford County Music Festival last year, where The Rev and company put on a show that got plenty of boots stomping along, despite all the mud.